To regenerate, or not to regenerate? Researchers shed light on key immune mechanisms and spatiotemporal dynamics that orchestrate spinal cord regeneration in zebrafish. The zebrafish is a well-recognized model system used for vertebrate regeneration research, including, but not limited to, heart, liver, brain, fin, and spinal cord regeneration1. The observation that a robust immune response is elicited upon spinal cord injury is not a novel one2; yet key mechanisms, cell types, and spatiotemporal dynamics are still to be elucidated in a vertebrate system. Macrophages, neutrophils, and microglia are fundamental innate immune cell types that elicit an immediate immune response upon injury, yet their dynamics are rapid and thus difficult to study. The zebrafish embryo is a unique model system as it only possesses a functional innate, but not adaptive, immune system at embryonic and larval stages. This makes it highly effective for dissecting mechanisms of innate immune cell infiltration and axon growth during spinal cord regeneration in vivo (Figure 1). Figure 1. Schematic of multistep process of spinal cord regeneration in zebrafish (Figure 1a from Mokalled et al., 2016). How do infiltrating immune cells control cytokine dynamics to promote mechanisms of regeneration? In this preprint, Tsarouchas et al use the zebrafish embryo to show that peripheral macrophages control a delicate balance of pro-regenerative and pro-inflammatory cytokine production to promote successful axon regeneration. They show that macrophages, but not neutrophils, are necessary for the regulation and maintenance of this cytokine balance. They conclude that an induction of tnfα but reduction of il1β is necessary and sufficient to sustain successful axon regeneration through development. Importantly, the tight spatiotemporal control of cytokine induction was key for long-term regenerative success; early induction of a pro-inflammatory response, but a switch to an anti-inflammatory response after 24 hours is needed for effective regeneration. Notably, macrophage mutants were unable to switch between these biphasic cytokine states, resulting in unsuccessful axon regeneration. The textbook view in immunology is that sustained induction of pro-inflammatory cytokines, such as tnfα, is responsible for chronic injury and a failure to elicit repair responses. This study importantly challenges this dogma by dissecting the dynamics of cytokine production through injury and development, to show that appropriate and timely induction of pro-inflammatory cytokines can in fact play a key role in repair. Not only will these findings inform future directions in regeneration research, but they could shape our view of immune dynamics in other disease models, such as Inflammatory Bowel Disease, that also currently view cytokines like tnfα as detrimental to healing and repair processes. 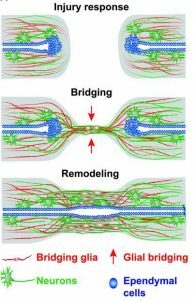 The authors do discuss the intricacies of axon bridging as a potential therapeutic strategy, as shown in neutrophil-depleted mutants, however this idea could be further explored. How does axon bridging naturally take place, and what immune mechanisms are necessary to orchestrate the process? How do patients with defects in innate immune populations such as neutrophils and macrophages, resolve injury induced by noxious stimuli? What are the cytokine levels and spatiotemporal dynamics in patients with dysfunctional macrophages? Could these patients be targeted for “personalized cytokine induction”? Further, this study is carried out with the goal of dissecting primarily innate immune mechanisms of repair; how would these dynamics be altered with the emergence of a functional adaptive immune system in vivo later in development? Investigating the intersection of immunology, regeneration, and the use of novel model systems, will help us answer these questions and provide new avenues for translational approaches in spinal cord regeneration. Gemberling A, Bailey TJ, Hyde DR, Poss KD. The zebrafish as a model for complex tissue regeneration. Trends in Genetics. 2013;29(11):611-620. doi:10.1016/j.tig.2013.07.003. Mokalled MH, Patra C, Dickson AL, Endo T, Stainier DYR, Poss KD. Injury-induced ctgfa directs glial bridging and spinal cord regeneration in zebrafish. Science. 2016;6312(354):630-634. doi:10.1126/science.aaf2679. Trivedi A, Olivas AD, Noble-Haeusslein LJ. Inflammation and Spinal Cord Injury: Infiltrating Leukocytes as Determinants of Injury and Repair Processes. Clinical neuroscience research. 2006;6(5):283-292. doi:10.1016/j.cnr.2006.09.007. Shikha makes some very good points on the complexity of regeneration in her discussion of our study. We were surprised to find such a high level of complex tissue interactions of immune and other cell types already in this “simple” larval zebrafish system during spinal cord regeneration. We hope that the excellent optical and genetic accessibility of this system will allow us to discover important principles of successful spinal cord repair with translational relevance.